(BOWIE, Md.) -- Bowie State University students looking to start their own businesses have a new campus resource to provide them the support to grow their companies and connect with expert coaches. The Entrepreneurship Academy (EA) is an initiative started by the College of Business in fall 2013 to provide a pathway of practical learning opportunities to help college and high school students, especially those from at-risk communities, establish and develop their own businesses. On Tuesday, Oct. 7, a ribbon-cutting ceremony celebrated the grand opening of its Student Business Hatchery in the Center for Business and Graduate Studies. of the Student Business Hatchery. The Student Business Hatchery provides workspace for the top three winners of the first annual BSU Business Idea Competition, held in spring 2014. There, those students – Kevin Mack (‘14), Kristy Williams (Master of Public Administration) and senior Stanley Morgan (business administration) – will continue developing the concepts for their ventures and receive coaching and advice from members of the program’s advisory council, composed of local entrepreneurs, BSU faculty, company presidents, and other business professionals. 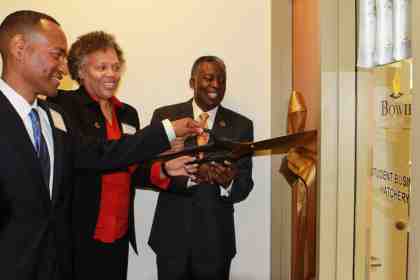 Through collaborative efforts with its partners, the EA aims to nurture student entrepreneurs and prepare them for local and regional business plan competitions, in the hopes that they will be considered for membership in the Bowie Business Innovation Center (Bowie BIC), the regional business incubator also located at Bowie State. The Bowie BIC supports early-stage businesses to achieve goals to expand and achieve success over the long term. In addition to the Student Business Hatchery and Business Idea Competition, the EA also hosts a summer entrepreneurship camp for high school students, held for the first time in summer 2014. Last month, the EA hosted a prelude to the grand opening with the sponsorship of the FedEx Showcar appearance at Bowie State. Dr. Minnette Bumpus, EA Executive Director and assistant professor of Management, Marketing and Public Administration, said the initiative is a resource to educate the campus and local community about entrepreneurship. In mid-November, she said the EA will host educational events to mark Global Entrepreneurship Week (GEW), the world’s largest weeklong celebration of innovators and job creators. Bowie State University (BSU) is an important higher education access portal for qualified persons from diverse academic and socioeconomic backgrounds, seeking a high-quality and affordable public comprehensive university. The University places special emphasis on the science, technology, teacher education, business, and nursing disciplines within the context of a liberal arts education. For more information about BSU, visit the website at www.bowiestate.edu.